David Gaussoin and Wayne Nez Gaussoin, (Diné [Navajo])/Picuris Pueblo), Postmodern Boa, 2009, Stainless steel, sterling silver, enamel, paint, and feathers, Courtesy the designers, Courtesy of the designers and the Museum of Indian Arts and Culture. 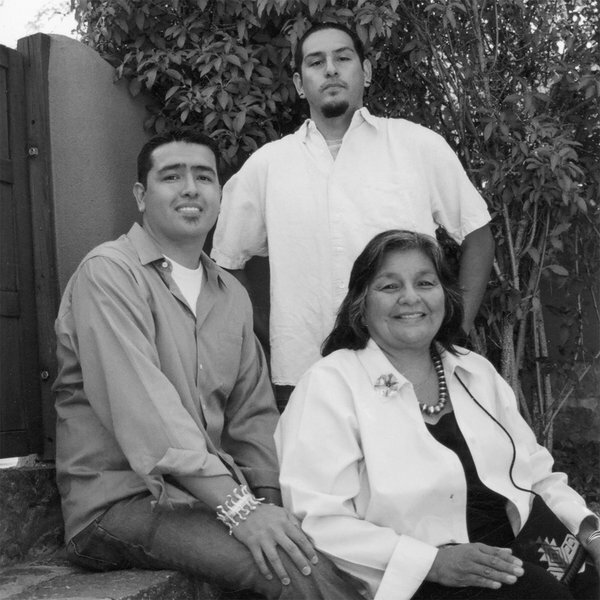 Next up in our Artist Spotlight series for Native Fashion Now are brothers David Gaussoin and Wayne Nez Gaussoin. They use collaborative artwork to challenge the definition of fashion. Because of this, David and Wayne Nez Gaussoin are featured in the Provocateurs section of the exhibition. Provocateurs create pieces that push the boundaries between art and fashion. The pieces range from experimental to sculptural to conceptual. We recently interviewed the dynamic brothers. Why is fashion your medium? David: I grew up in a jewelry family, so fashion was the perfect evolution of what I do. I found most clothing out there didn’t allow my jewelry to breathe, so I had to create my own. I enjoy using the body as a pallet, and also enjoy the fact that it is functional art. Wayne Nez: I grew up learning silversmithing from my mother Connie Tsosie Gaussoin and my older brother David, so I used to follow their lead for art shows. I still do, but some of the work has grown past that, and needed to be seen on a runway and on the body. I am actually finishing up my Masters of Fine Arts with a Minor in Museum Studies now at the University of New Mexico, where I have been exploring wearable work and installation art that I plan to incorporate in future fashion events. In your opinion, what is the difference between inspiration and appropriation, especially in the fashion world? David: Good question, I struggle with this all the time. Sometimes it’s a fine line between the two. I think I will allow the “experts” to define this answer. However, I feel once you start putting restrictions/rules on artists, thus begins the slow death of creativity. Wayne Nez: I think that they go both ways. I can only speak for myself as a Native American artist who teaches and studies art. Art is always being appropriated, it’s just in what your intent is and what you’re using it for. From there you know whether it’s right or wrong. How has your heritage influenced your artwork? David: It is who I am, so it always finds its way into my work. However, it does not define my work. I am also a person of the world, so I am influenced by all my surroundings. Wayne Nez: That’s a loaded question. My heritage is Picuris, Navajo, French American, American, New Mexican, Santa Fe-an, Pop Culture, Popular Culture. It’s twisted all in my work. What messages do you want your artwork to convey to visitors? David: I enjoy provoking my audience by shock! Once I have your attention, I hope to pull you in to see the beauty. I hope to give a message that our work as Native artists is just as serious as other western art. As I travel the world, and the great museum institutions, I always feel our work gets stereotyped or forgotten altogether. Wayne Nez: I think it would be “oh cool.” That is real Native American art today, from a real Native American. What have been your greatest inspirations? David: I am inspired by the simple beauty that surrounds all of us, that we tend to take for granted. Wayne Nez: Currently, as I am wrapping up my MFA—being a “professional” artist. Getting up each day and hitting the studio all day, sometimes all night, managing day-to-day operations, I hope will inspire younger Native American artists that art can be a profession and not just a hobby. 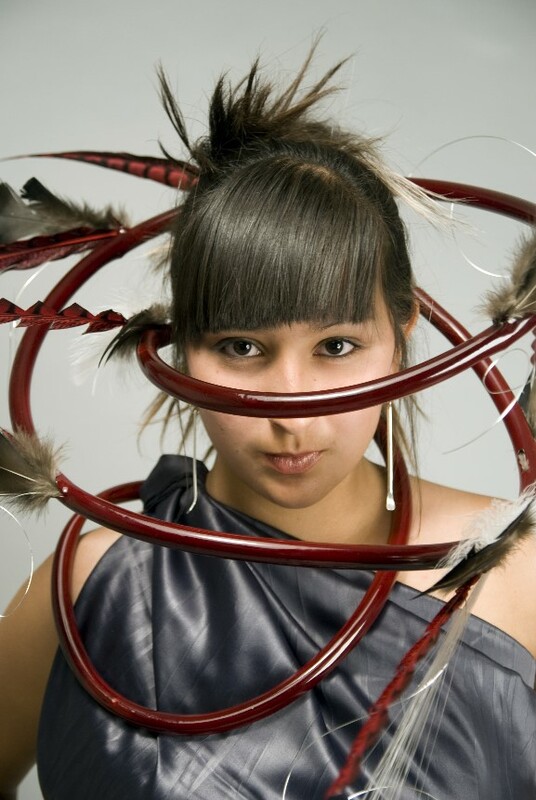 For more Provocateurs, visit Native Fashion Now before it closes September 4.